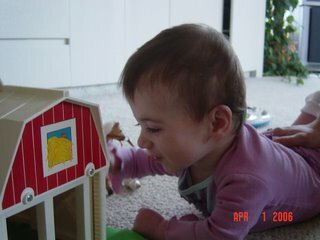 Check it out: Charlotte is playing with a farmhouse toy that belongs to my 10 and 14 year old nieces! Hal & Sue’s house is all decked out for the kid. I swear, they have more baby toys that we do. Charlotte had her 2nd to last Synagis shot (prophylactic against RSV) of the flu season today. Each time she gets a shot, they weigh her so they can get the dose just right. Charlotte’s official weight at 11 months and 2 days is —drumroll please—18 lbs. 1 oz.!!! Why is this a good number? Well, first of all she’s gained 1 lb. 5 oz. since being weighed on March 11. Second, in Hebrew the characters that make up the number 18 are also the characters that make the word “life.” (I’ve tried to find an image to upload, but have not been successful.) Seems to me that “life” + 1 oz. at just about 1 year is pretty good for our little munchkin. When we raise a toast, we typically say “L’Chaim” or “To Life.” Yes, now you can all sing along with the tune from Fiddler on the Roof. And, for the record, tooth #5 is peeking out of the top gums. Unfortunately for me, that means no eating and lots of vomiting, much congestion and mucus and lots of retching. We’ve cleaned up twice today, changing clothes at the doctor’s office, and it’s only 10 a.m. Fingers crossed that she’ll take a long nap so I can get some stuff done before the next explosion. 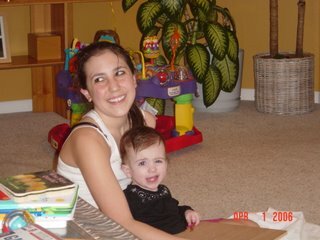 My sister Laurie reading to Charlotte. Maybe someone in NJ will finally show Laurie the blog. 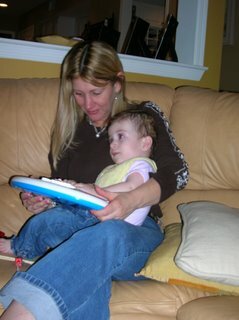 Maybe seeing her niece’s picture and reading her story will convince Laurie to learn how to use the computer. Seriously. Even Gomez would have given in by now.